The default pricing is based on AM4378 running at 800Mhz and 512MB DDR3L. Embedian continues to optimize and expand its portfolio of SMARC solutions for the embedded market. With the Sitara AM4378 processors support for the ARM Cortex-A9 core, extending performance by up to 40 percent over the Sitara AM335X processor line and up to 1GHz. These high performance successors to the popular SMARC-T335X platform integrate additional features to support a variety of markets from human machine interfaces (HMI) to IoT gateways to industrial automation. 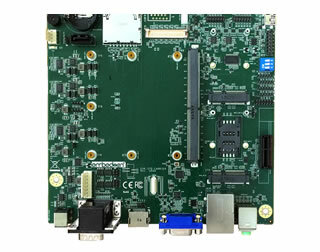 In addition to the new Cortex-A9 core, highlights of the SMARC-T4378 include 24-bit parallel LCD interface, dual-port gigabit Ethernet and richer legacy peripherals. SMARC-T4378 supports both SMARC 1.0 and SMARC 1.1 standards (automatically detect). 2: I: Industrial temperature (-40oC ~ 85oC); Leave it Blank for normal temperature. 3: C: Conformal Coating, only support industrial temp. ; Leave it Blank if you do not need it.